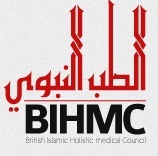 The British Islamic Holistic Medical Council (BIHMC) is a voluntary organisation representing and regulating Islamic complementary practitioners and therapists in Britain and Ireland. BIHMC is regulated by GRCCT The General Regulatory Council for Complementary Therapies who are the UK Federal Regulator for Complementary Therapies. Regulation and registration of complementary therapists in the UK is voluntary self-regulation. This means that there are no laws in place to protect the public from unqualified or incompetent therapists. For the past ten years and in accordance with recent government recommendations, the various professional associations in each therapy have been working together to agree standards and requirements for each type of complementary therapy. We are dedicated to setting and promoting the very highest standards of complementary medicine and natural healthcare, to ensure best practice for practitioners and their clients. As a result, BIHMC members are recognised as leaders in the field of Islamic health. We administer a directory of practitioners. The BIHMC supports any Islamic recognised therapy, providing training standards are high and our codes and disciplines are adhered to. We welcome all practitioners and associations that recognise the importance of working together within an umbrella group for the benefit of all. We embrace freedom of expression and respect for all, and we encourage the sharing of ideas and resources. We set out to protect the unique and holistic values of each therapy, within sensible regulatory parameters. Another role of BIHMC with GRCCT is to provide a robust complaints procedure which in the event of a proven complaint has the option of removing the practitioner from the national register and and take legal action through with the local Environmental Health Dept in that city or town. Practitioners on the National Register agree to abide by BIHMC Code of Professional Conduct & Ethics, are answerable to the BIHMC / GRCCT Complaints and Disciplinary procedures, maintain their training and knowledge with continuing professional development and have in force professional indemnity and public liability insurance. Please also bear in mind that the Complementary Therapies regulated by GRCCT are practised by in excess of 50,000 practitioners in the UK. BIHMC provides the public with information services for the safe and appropriate choice of Complementary Medicine. BIHMC believes in promoting the standard of Best Practice in addition to the basic standard of Safe Practice for all practitioners and therapists who work within Complementary Medicine. BIHMC actively supports the regulatory process for Complementary and Alternative Medicine (CAM). At present the BIHMC is assisting several Working Groups in the field that are considering both Statutory and Voluntary Self-Regulation. Our thanks to BIHMC from England for sharing the above post. If you have any questions or want to leave some feedback on their training, then please do so via a comment* below.